Creativity Bites Back! : Using the Correct "Marks"
I am no expert in English. It is a second language for me, so even when my level is pretty advanced -I write, read and speak at a very decent level-, I still have a lot to learn. Nevertheless, I never considered quotation marks a challenging punctuation mark. To start with, the name already tells you for what are meant: to quote a person or to indicate the name of a book or a title. I also understand that a secondary common use is to indicate that you are using a word in a sentence not by its true meaning but as someone else uses it, giving it almost the opposite meaning. It has an ironic side, in some way implying you don't really believe that is the right word to apply there. 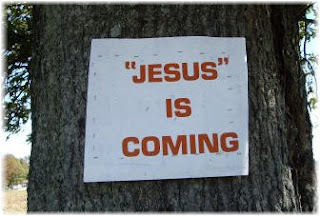 Then, I trip over "The 'Blog' of 'Unnecesary' Quotation Marks"... and I couldn't believe my eyes! It seems that a lot of people out there are convinced that the main purpouse of the quotation marks is to give emphasis to a word, what only contributes to a terrible overuse of this particular punctuation mark. 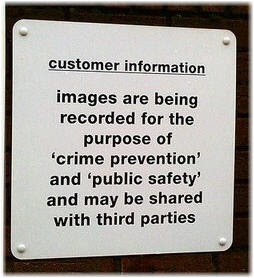 But the "Quotation Marks" website has much, much more funny pictures. In the first example, the intention could have been to use the slang term dogs, meaning feet... as in "man, my dogs are barkin'!" 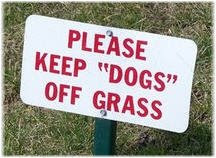 The meaning of the sign would then be "please don't go walking all over my lawn".